Maybe you need just a couple of blocks from a multi-block plugin you have installed, but that plugin brings a bunch of other blocks as well. Why clutter the block inserter with blocks you or your clients will never use? Fortunately, there’s a new plugin that solves this problem. 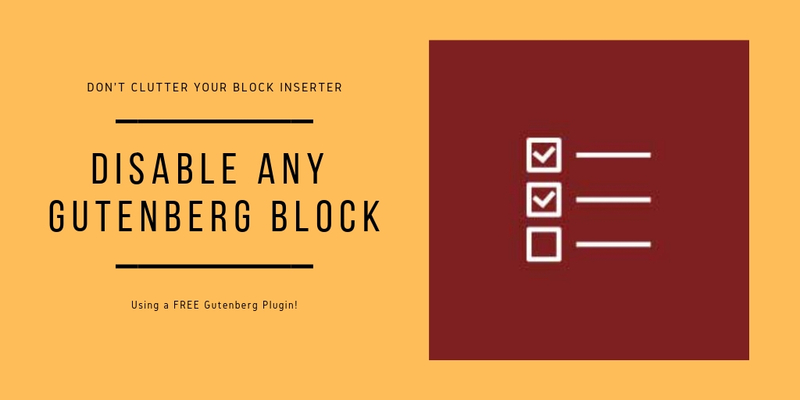 ‘Disable Gutenberg Blocks’ allows you to remove all the blocks you have no plans to use, leaving you with just the ones you do. The plugin is completely free and works with all blocks. Once you have installed the plugin, navigate to your wp-admin, then Settings → Disable Blocks. Blocks can be disabled individually or in bulk and can be re-enabled later if you change your mind.